In powder form it is pyrophoric in nature (attacked by air and water). Oxidation is parabolic in nature. Cobalt-60 is an isotope of naturally stable Cobalt-59.An isotope is a form of an element that has different number of neutrons. The unstable isotopes are generally radioactive, and are made artificially or by the decay of larger elements.Cobalt-60 emits γ-rays which is used in industrial, medicinal radiography and for the sterilization of the food and surgical instruments. In medical field, it is used to kill the cancerous cells in the radiation therapy.Cobalt-60 can be inserted internally by implanting the radioisotope on or near the cancerous cells. It can also be given externally by using the gamma rays of cobalt-60 for harder to reach areas by using teletherapy machine. This typically requires cobalt-60 pellets of 1mm in diameter and 1mm in length with density of about 95% of the theoretical value. Industrial use of Cobalt radioisotopes involves Non Destructive Testing (NDT) of samples having cracks and internal flaws. The largest use of cobalt is in super alloys, which are used to make parts of gas turbine, aircraft engines etc. 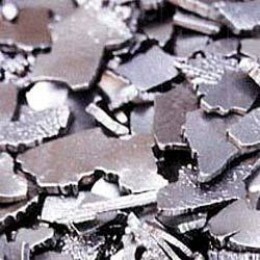 Cobalt is also an important ingredient in other materials like cemented carbides, tool steels, magnetic materials, paint pigments, catalysts and artificial γ-ray sources. Cobalt-60 is the gamma emitter and it is obtained from Cobalt-59 by bombarding with neutrons. Channels are there in the reactor for inserting slugs and the pellets inside the nuclear reactor. A normal nuclear fission reactor takes three full power reactor years for the conversion of the total cobalt-59 to cobalt-60. These radioactive pellets are then nickel coated and kept under the water when they are not in use, to prevent the radiation hazards. § As a radioactive source for food and blood irradiation. I in finding it very bothersome to inform the reality then again I will definitely come back again. You completed several fine points there. I did a search on the matter and found a good number of persons will go along with with your blog. Thanks a lot for sharing this with all folks you really recognize what you are talking about!